There will be a variety of small to large semi-detached and detached villas at this location to suit everybody’s taste and pocket with a wide choice of specifications and extras available. All the villas will be built to a high standard and will have space for a private pool. This model is a semi-detached villa with 2 bedrooms and 1 bathroom with a 54m2 build all on one level on a 175m2 plot. It has roof top solarium and a garage of approximate 16m2 where will be a water supply and drainage for a shower room. It is also possible to build another bedroom and bathroom on the roof of this semi-detached property with outside access for an additional 23,100€, plans are now available. There will be a variety of small to large semi-detached and detached villas at this location to suit everybody’s taste and pocket with a wide choice of specifications and extras available. All the villas will be built to a high standard and will have space for a private pool. 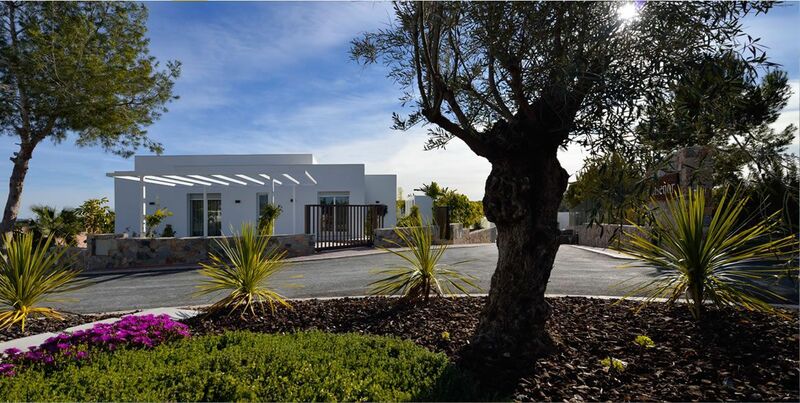 This model is a semi-detached villa with 2 bedrooms and 2 bathrooms with a 61m2 build all on one level on a 175m2 plot. It has a garage of approximate 16m2 where will be a water supply and drainage for a shower room. It is also possible to build another bedroom and bathroom on the roof terrace for an additional 39,000€. A roof top solarium could be available at an additional cost. There will be a variety of small to large semi-detached and detached villas at this location to suit everybody’s taste and pocket with a wide choice of specifications and extras available. All the villas will be built to a high standard and will have space for a private pool. This model is a detached villa with 2 bedrooms and 2 bathrooms with a 72m2 build all on one level on a 350m2 plot. It has roof top solarium and a garage of approximate 16m2 where will be a water supply and drainage for a shower room. It is also possible to build another bedroom and bathroom onto this detached property for an additional 26,000€, plans are now available. There will be a variety of small to large semi-detached and detached villas at this location to suit everybody’s taste and pocket with a wide choice of specifications and extras available. All the villas will be built to a high standard and will have space for a private pool. This model is a detached villa with 3 bedrooms and 2 bathrooms with a 77m2 build all on one level on a 350m2 plot. It a garage of approximate 16m2 where will be a water supply and drainage for a shower room. The roof top solarium can be available at an additional cost. 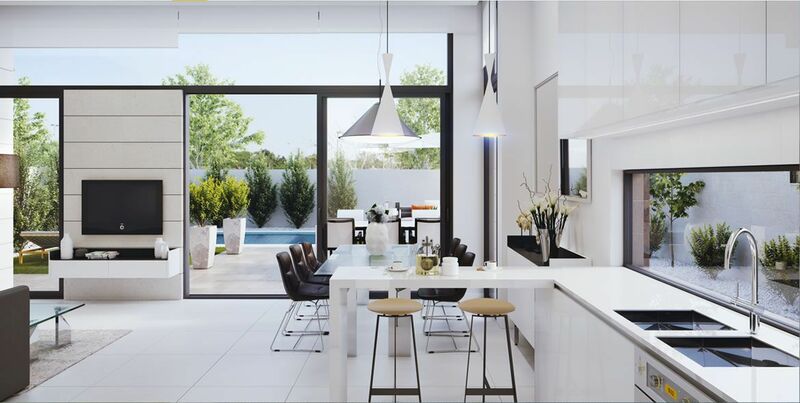 These beautiful semi-detached villas have been thoughtfully designed to provide the perfect individual contemporary living space, featuring double full glass sliding doors that open directly onto a large terrace with a private swimming pool and enclosed gardens along with off road parking. These properties are built over two floors, on plots of 153m2 and have 3 bedrooms and 2 bathrooms. The ground floor has an American style kitchen with a breakfast bar, a large living/dining room, a bedroom and a bathroom. There is an exterior storage room too. The first floor comprises of two further double bedrooms and a family bathroom. One of the bedrooms has direct access to the large terrace, which has stunning views to the surrounding area. These properties also have generous sized rooftop solariums with glorious views to the beaches and the golf course. 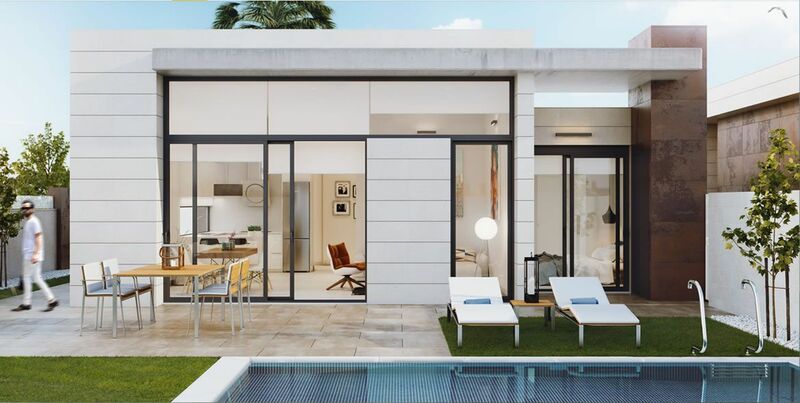 These semi-detached villas include everything as seen in the show house – interior and exterior lighting, electric shutters, white goods in the kitchen, a full furniture pack, a cascade pool, and an outdoor summer kitchen and a pergola on the solarium. Other features included in the price are: double glazing, an armoured front door, pre-installation of air-conditioning, shower screens in the bathrooms and fitted wardrobes in the bedrooms. 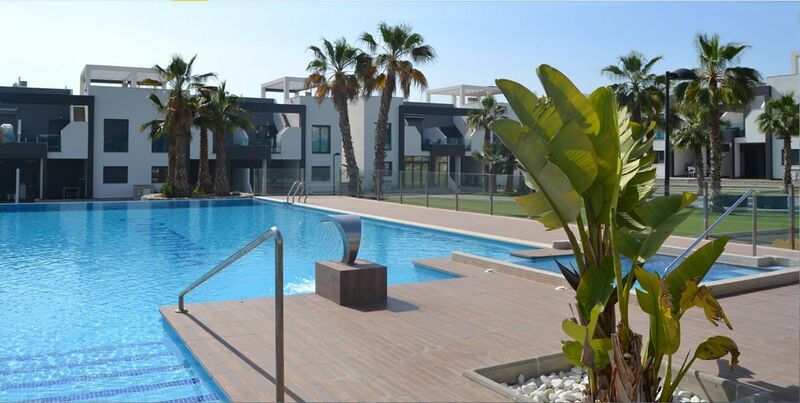 These properties are just 5 minutes from the popular beaches of Los Alcazares and its main high street. The main plaza of Los Alcazares is just a 15 minute walk with an array of banks, bars, bakery local tape’s bars and international restaurants. 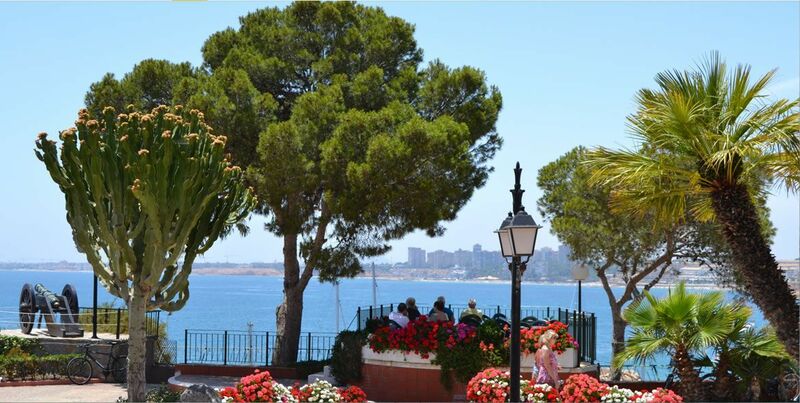 The promenade of Los Alcazares is an amazing place to pass your time either in the day or evening, with countless restaurants to choose from, and some great little tapas bars just by the sea, or the ever popular marina. This area offers a variety of sports activities, including seasonal water sports. Los Alcazares is a well-known golf destination due to its warm winter climate and the large variety of golf courses in the area, which are open all year round. 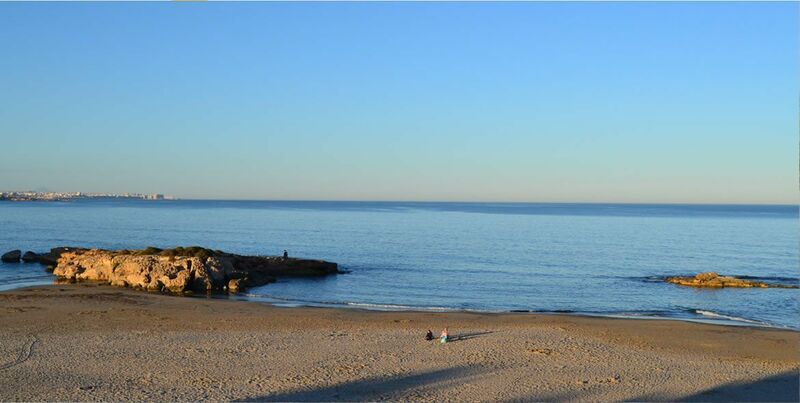 Here you can find some of the best beaches in the Murcia region; many have been awarded "Blue Flag Status" based on their cleanliness, safety and facilities. Corvera (Murcia) airport is just 15 minutes away and Alicante airport is 60 minutes away. 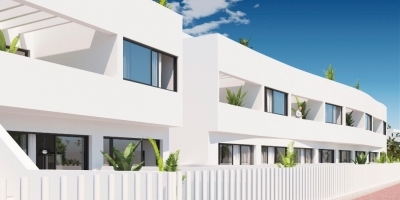 This luxury development of 41 detached villas with their own private swimming pool, garden and a roof top solarium, are located in Los Alcazares, and just 440 metres from the beach. These stunning villas have an underground community garage with a parking space and storage room included in the price. These villas are built over two floors, on plots of 123m2. The ground floor has a large lounge/dining area, an American style fully fitted kitchen with white goods, a double bedroom and a bathroom. From the lounge, there are large sliding doors leading out into a private garden with a lovely swimming pool and sun terrace. The first floor has two more bedrooms, one of which has a private large terrace, a guest bathroom and exterior stairs leading to a private roof top solarium, which is equipped with a summer kitchen. Included in the price of these villas are: double glazing, fitted wardrobes with an upper shelf, hanging bar and drawer, pre-installation for air conditioning, under floor heating in the bathrooms and a fitted kitchen with an extractor, an oven, a hob, a fridge freezer, a microwave and a dishwasher. This development is set in an enviable location, situated only a few minutes’ walk from the town centre and the sea. Los Alcazares is a well-known golf destination due to its warm winter climate and the large variety of golf courses in the area. Courses are open all year round. Los Alcazares has some of the best beaches in the Murcia region; many have been awarded "Blue Flag Status" based on their cleanliness, safety and facilities. Who is the foreign buyer of property in Spain? According to the most updated data, 20% of the total purchase of housing in Spain is made by foreign citizens. In this article we explain where they come from. The Mediterranean coast of Spain enjoys a special attraction for citizens of other countries because of its warm climate, its Mediterranean lifestyle, and its cheap cost of living. To all these factors must be added for years a real estate market that fits perfectly to their needs, both for the wide variety of prices and for the varied types of housing. The demand for housing in Spain by the British is usually made up of retired citizens, middle-aged retirees, married, some with children and grandchildren, a high level of professionalism and average annual income of 36,000 euros. They demand pleasant climates, good services, quality of life, and excellent air connections that give them a sense of closeness to their loved ones and friends. Scandinavian buyers are often couples, made up mostly of middle-aged people (50 to 55 years) with higher education and average income that usually exceed 90,000 euros per year. More than any other nationality, they value the sun and the quality of the beaches. Of similar characteristics to the Scandinavian, they are usually constituted mainly by couples, with children, in the age bracket of fifty years, high professionalization and income of not less than 60,000 euros to the year. They look for mainly for the sun and beaches; and are very interested in golf courses, so the Costa Calida satisfies their tastes and preferences with its traditional and excellent facilities. This segment is made up of people aged between 45 and 55 years old: retired people, families with a high level of education and income of around 40,000 euros per year. Likewise, they are attracted by the climate, socio-political stability, they look for amenities and proximity and good connection with their country. Golf Sun Spanish Properties offers you new developments in Los Alcazares, Murcia. 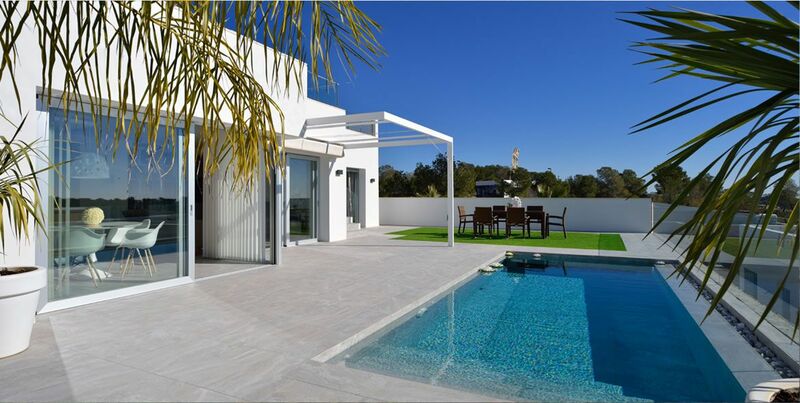 If you are looking for new build properties on the Costa Calida and Costa Blanca, you are in the right place. Golf Sun Spanish Properties works with the best developers to offer you the best chalets, apartments, townhouses and bungalows in the region. Contact us today, tell us what you are looking for and we will be able to work to find the house that best suits your needs.